Playfulness with language is so much fun when reading Pratchett, but jokes based on homonyms lose their effectiveness on screen. It is possible that the reason more episodes of British fantasy phenomenon Terry Pratchett's hugely popular Discworld series have not been translated into film is because, frankly, they don't translate well into film. Originally, the two stories included in this two disc set were produced for British television, and perhaps when taken in bite-sized chunks they might capture an audience's attention. When run back to back, however, the animation style becomes tedious very quickly. Each segment starts off well enough, with a 360 degree view of Great A'tuin the planet-sized turtle and the four enormous elephants who stand on his back facing in each of four cardinal directions, balancing the world of the Disc above them. The slightly dated animation of the opening sequence pales in comparison to the disappointing cartoonishness of the films as a whole, however. Most of the Discworld novels take place largely in the bizarre urban sprawl of Ankh-Morpork. These two films break a bit of new ground, so at least the scenery keeps changing, though it might have been interesting to really explore the world of the gritty, crime-infested city that usually hosts the beloved Discworld characters. Then again, with darkened forests, sheer cliffs and never-ending fields of cabbages providing such an animation challenge, perhaps more time spent in Ankh-Morpork would have been too difficult to render properly. 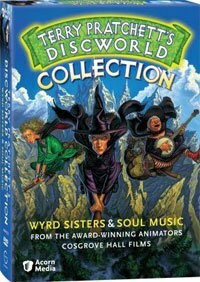 In Wyrd Sisters, three witches who generally try to stay out of the spotlight in the tucked away Discworld country of Lancre get drawn into local politics when the machinations of the regicidal cousin of the king force them to take an interest. With a muddle of accents and no subtitles available, it is difficult to understand some of the conversations and the rough animation means lipreading is not an option. Though the animation style is more or less two-dimensional, a few dominant characteristics come through clearly. Granny Weatherwax has a pinched face, and disapproving attitude about most things, but is most in control of her powers, as the leader of the three witches. Nanny Ogg, with a flask stuffed down her ample bosom, is as happy drinking the night away and carousing with the lads as she is casting spells. And young Magrat Garlick, with her drawling accent and inexperience, is trying to figure out her place in the witching world when the books say to cast a spell one way and yet her seasoned cohorts cavalierly substitute magical materials and methods when ill-prepared. Shakespeare is an acknowledged influence of the plot of Wyrd Sisters, the tale of Macbeth in particular playing a large role, but many of the lines that are borrowed by Pratchett and reinvented for the purposes of parody are mauled by the jumbled speech delivered by flat animation. Lines erupt with such speed and are mangled so that the viewer has difficulty recognizing familiar plot twists or clever insults. Though the characters may explain themselves and their motivations it's so tough to understand them that I had a sense the entire time of having no idea why anything was happening, or indeed, what was happening. There is at least an emphasis on thespian tradition and the power of words to rewrite history to new specifications by the ruling class that cannot be misunderstood, and fans of the Discworld series will appreciate the underscoring of that theme. One recurring Discworld character, Death, is, ironically, a breath of fresh air in this adaptation. With frozen grinning skeletal face and frequently blazing blue eyes, not to mention his dry sense of humor, Death is not simply a force to be reckoned with, he is a pleasure to welcome to the screen. Christopher Lee (Lord of the Rings) is absolutely spot on with his deep booming voice and careful enunciation. Death as a character in the novels always has a great sense of the absurd as well as a carefully tended sense of pragmatism, and thankfully this shows through in both cartoon adaptations. As it turns out, Death, and his granddaughter Susan, take center stage in the second film of this boxed set, Soul Music. Or perhaps I should say that the 'The Band with Rocks In' takes the stage, inspired by the anthropomorphized influence of Music itself. Susan is forced to step into her grandfather's role as he wanders the Disc, trying to forget his millennia of disturbing memories. Not having realized she even had a grandfather, Susan adapts remarkably well to her new responsibilities. Until she gets caught up in the bizarre success of The Band with Rocks In. Following a rock band around can be a bit detrimental to one's other duties. The animation is slightly more polished in the second film, and a lot of the action centers around musical performances, which makes the whole affair simpler to understand, and more fun to watch. From the absurdity of the Musicians' Guild sending assassins after those who forgo paying dues, and the likelihood of getting ripped off by a sneaky agent, the whole adventure is a parody of the music industry in the world outside of the story. The central musician, Imp Y Celyn (which apparently translates from Welsh, meaning 'Bud of the holly' according to Wikipedia's entry "Soul Music") starts out playing the harp and is determined to become a famous musician. Imp changes his name to Buddy first off and jump-starts his career when he stumbles across a guitar in a music shop that has been possessed by something like the Spirit of Music. Before Buddy knows it, Music is playing him, as well as fellow budding musicians Glod Glodsson the Dwarf and 'Cliff' Bluestone the Troll. Oftentimes Pratchett's clever language jokes are lost in the dialogue of the screen since the visual cue of the printed words is necessary to cotton on. I caught one of Quoth the raven's lines as he and the Death of Rats embark on a mission to replace Death once he goes missing: "Carrion regardless, that's what I always say." Playfulness with language is so much fun when reading Pratchett, but jokes based on homonyms lose their effectiveness on screen. Pratchett does point out in the half hour special features interview that he thinks perhaps the reason he has become so popular in the Czech Republic is that the local tongue has a tremendous aptitude for wordplay in translation. Rock and Roll is sung about and talked about as though it is some kind of a living thing – it won't fade away, it'll never die. It has a meaning quite apart from a particular type of musical sound, and then consider the large number of people to whom it offered tremendous fame for a few years and then sudden death, as if there was some kind of devil's bargain going on. Of the concept of animating the Discworld, "It's the poetry of the voices that I really appreciate," says Pratchett of the actors cast to voice the characters of the films. He admits that although the action of the books seems to play like a movie in his head, and he then writes it down, he doesn't see the faces of the characters clearly. The voices are more prominent during the writing process. For those who relish the idea of getting their Discworld fix on screen, Pratchett expresses his confidence that in the future there will be more adaptations, possibly even non-animated ones. After all, the future is a big place.